Here are more examples of political cartoons, for this election week. These are part of a series drawn for the Taxpayers Alliance, which ran on its site for about three years, illustrating various pages. 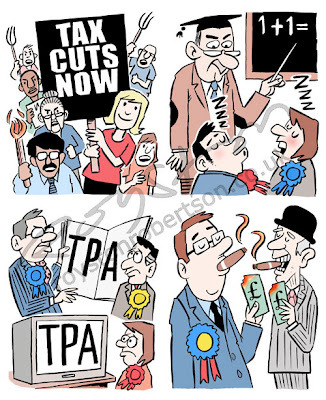 Of course, the TPA is at a very different point on the political spectrum to the Green Party, proving that I am a shameless mercenary who goes where the money is. But you can't always do work that reflects your political viewpoint. As George W. Bush once famously said, a man has to put food on his family.